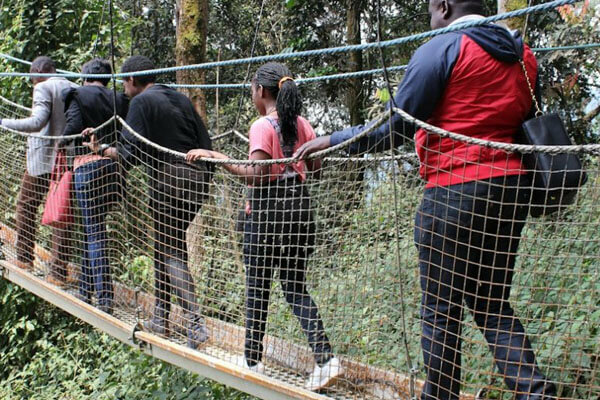 6 Days best of Rwanda safari trip takes you to explore the best of Rwanda, including gorilla trekking, ibyiwacu cultural tour, golden monkey tracking, Dian Fossey hike, cultural tour. Alongside, you will visit the beauty of Kigali, declared Africa’s Cleanest City. Pick up from either your hotel in Kigali or from the airport by our company representative who will take you on a tour of Kigali city to visit the gisozi genocide site, local markets and later hit the road driving north-wards to Volcanoes national park in Musanze province former Ruhengeri. Arrive late and check in to your lodge for dinner and overnight at Mountain Gorilla View Lodge / Volcanoes Lodge ( Luxury), Le Bambou Gorilla Lodge / La Palme (Mid-range), Muhabura Hotel (Basic). Up early for breakfast at your hotel, set off with the necessary tracking gear and packed lunch, you will move to the park headquarters for briefing, before proceeding with the ranger guides for the memorable adventure. The time taken hiking for gorillas highly depends on the moment of the gorillas since they are wildlife animals in the jungle. But your ranger guide has a rough idea where they maybe as he communicates with his colleagues who go earlier into the forest to track the gorilla movements. Its much advisable for you to be prepared with necessary gear and parked lunch as you begin the strenuous, but exciting adventure. A maximum of one hour is allowed with the Gorillas. After the encounter, head to your hotel for lunch, and in the afternoon have a cultural experience at the Ibyiwacu cultural village to lear about the Banyarwanda culture. Dinner and overnight. In the morning, you will need to go and track the primates like the golden monkeys, the baboons, and many others. In the afternoon head out on a tour of the twin lakes of Ruhondo and Burera. Return for Dinner and overnight.